This weekend we were treated to another lovely live performance at The New Victory Theater (you can read more about our first experience here). “Jason Bishop: Believe in Magic” celebrates the return to the theater of this internationally touring magician (he had a sold-out run at the theater in 2016), with a fabulous show that combines a mix of old favorites and new acts created especially for The New Victory. What’s so great about seeing a show at this theater is that every member of the audience has a clear view of the magic – important when your date is a little one who doesn’t want to miss a thing. 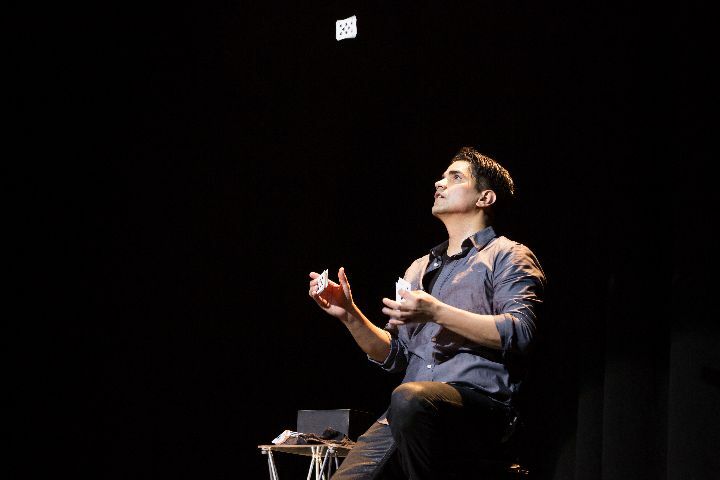 And you seriously will not want to miss a thing – this magician is extraordinary. Jason Bishop became enamored with magic as a kid in long-term foster care. He credits local libraries for sparking his interest in magic and helping him become the successful illusionist he is today. He is again accompanied by his assistant, Kim Hess, and his canine companion, Gizmo (or Dog #97), with a show that is the perfect way to ring in the holiday season! Noah loved Gizmo, and was enthralled each and every time Kim disappeared – and reappeared wearing a different outfit. So many other highlights too – snowfall in the theater, the “vanishing” of a million dollars, and what magic show would be complete without levitation? The New Victory is a real gem in our city, the perfect place to expose kids of all ages to live theater – in a warm and welcoming setting, and at truly reasonable prices! Note: I was not compensated for this post. The New Victory Theater kindly gifted us 2 tickets to “Jason Bishop: Believe in Magic”; all comments and opinions are – as always – completely my own.